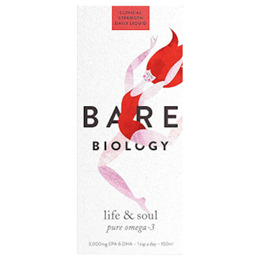 Bare Biology Lion Heart Fish Oil may be the most powerful omega 3 on the market, delivering 3500mg per teaspoon. If you`re going to take omega 3, take it in its purest, most powerful form. The well documented benefits of omega 3 are dependent on consuming effective amounts of EPA and DHA, the essential fatty acids found in oily fish. A liquid form is the most efficient way to get a powerful dose. Just one teaspoon of Lion Heart gives you 3000mg of EPA and DHA in the natural triglyceride form, keeping your body in tip-top shape. Every single batch is independently certified by the International Fish Oil Standards (IFOS) using the strictest purity and quality criteria, giving you a guarantee that this oil is pure and powerful as it contains no heavy metals or other contaminants. 3500mg omega 3 per 5ml dose. Super high concentration of EPA (2000mg) and DHA (1000mg). One teaspoon delivers the recommended daily dose of 3000mg EPA and DHA for normal blood pressure. Natural triglyceride form for optimum absorbency and easy digestion. Fish oil (from sardine, anchovy and mackerel), natural Sicilian lemon oil, vitamin E (tocopherol). Adults, children over 12 years of age, pregnant and breastfeeding women take one 5ml teaspoon daily. Once opened, keep refrigerated and tightly closed, for up to 3 months. 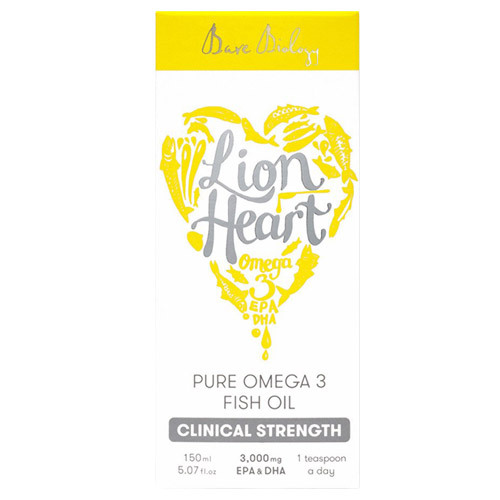 Below are reviews of Bare Biology Lion Heart Pure Omega 3 Fish Oil - 150ml by bodykind customers. If you have tried this product we'd love to hear what you think so please leave a review.